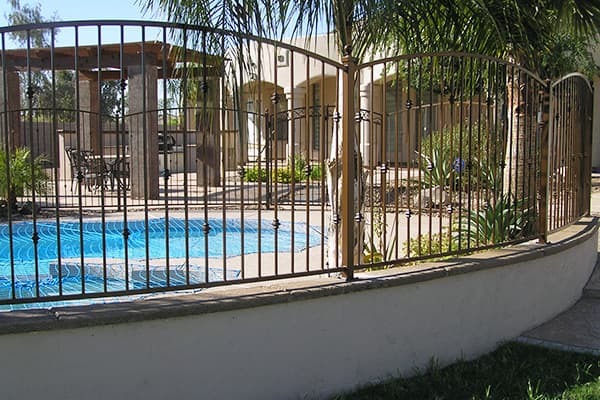 Sun King Fencing & Gates manufactures and installs custom decorative pool fencing in Phoenix. Call 602-989-0839 to discuss fencing options for your home. 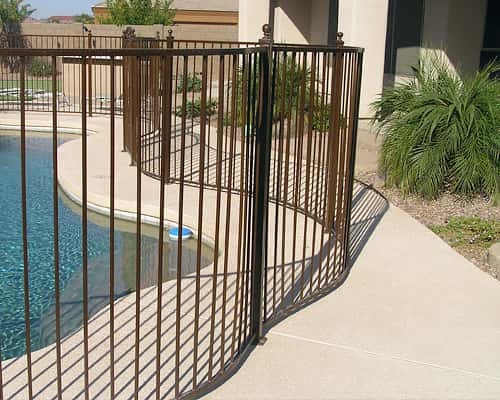 Enhance your poolside experience and security with a decorative iron pool fence. You take pride in your backyard pool. It's a place to relax and enjoy time with family and friends. One of the best ways to enhance the look of your backyard pool and provide safety is with the installation of a decorative wrought iron pool fence. 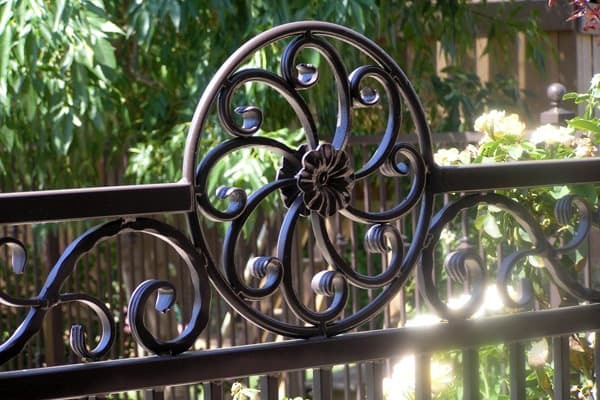 Sun King Fencing & Gates has been manufacturing and installing high-quality and visually appealing decorative wrought iron pool fencing in the Phoenix metropolitan area since 2002. Enhance your pool fence with high-quality design and features. 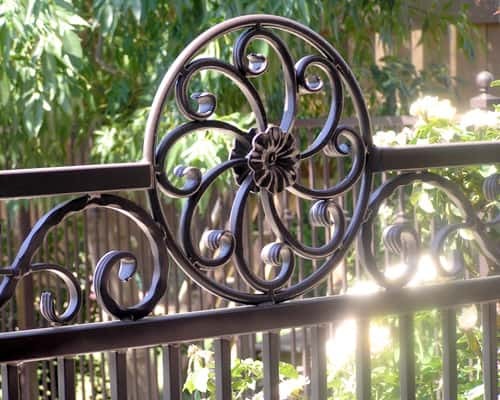 Decorative wrought iron pool fencing is very adaptable for the purpose of design. A dramatic statement can be made with wrought iron pool fencing including stylish accents. Choices in decorative wrought iron pool fencing can include a straight-top, moderately decorative pool fencing with two rails and decorative knuckles to a more elaborate design of decorative wrought iron pool fencing that includes ornate 3-rail arched Tuscan-style decorative pool fencing with hand-hammered Italian scrolls at the top, knuckles on the pickets and balltops on the posts. We also install a top mounted Magna Latch to prevent small children from entering the pool areas. Sun King Fencing and Gates builds all wrought iron pool fencing in accordance with Child Safe Fence Codes. We meet or exceed all local pool fence regulations giving you a childproof swimming pool barrier. All of our products are manufactured right here in Arizona. 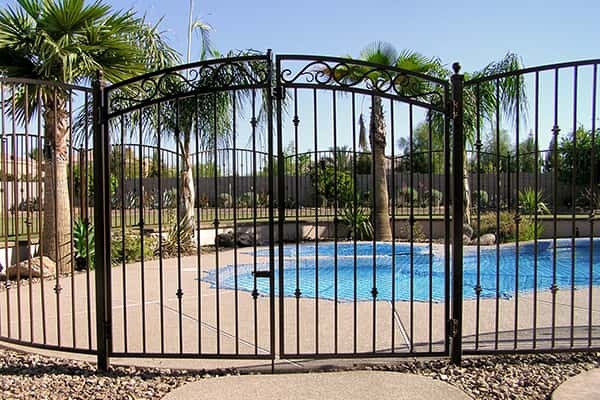 All of the decorative wrought iron pool fencing that is designed by Sun King Fencing & Gates is manufactured at our plant in Mesa, Arizona. We fabricate the fencing from high-quality bulk steel to fit your specific application. Then our experienced welders professionally put your design together. After careful cleaning of the steel, our experienced welders professionally put your design together. Once the decorative wrought iron pool fencing is fabricated, an epoxy-based primer is applied in our paint booth using an electrostatic paint gun. Next, we apply an environmentally safe polyurethane paint in the color of your choice. The polyurethane paint puts a plastic-like coating on the iron giving it a hard outer shell and protecting it from water and sun damage. Remember, decorative wrought iron pool fencing does not eliminate adult supervision so please watch your kids around water! Let's talk about enhancing your home with custom, wrought iron pool fencing. 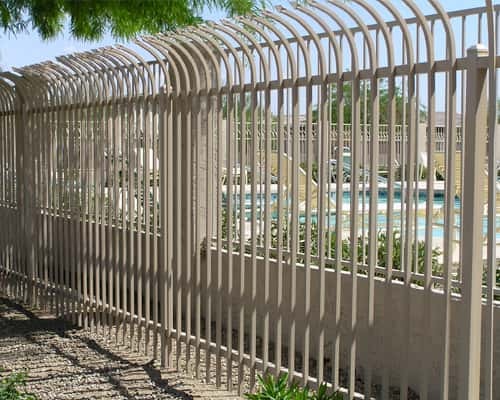 At Sun King Fencing & Gates, we build decorative wrought iron pool fencing to your individual needs. If you have a concept of what your wrought iron pool fencing is to look like, we would love to see your drawings, help you refine them, and make it become a reality. To find out how we can help you, give us a call at 602-989-0839. or you can email us using the provided form.